Thank you! I loved everything about the Wee Lima sweater. It will be my go-to pattern for every new baby from now on. i love your contrasting sock for using extra sock yarn. Great idea! I think that it looks even better than the first pair. Maybe because I like my socks a little crazy! When when when will we see your skirt?!!! You vacation plans sound absolutely divine, you deserve a good break, my friend! The skirt wasn’t blocked property by wet blocking so I’m forced to steam block it. I have to find the courage to do it! Any suggestions??? The fiber is 100% microfiber acrilic, whatever that means! I’ll steam block it as soon as I get some free and calm time. I don’t want to rush and mess it. Hmmm… As always google is the best adviser I guess. You are right to take your time and not rush – better safe than sorry! I love how your sock is turning out! 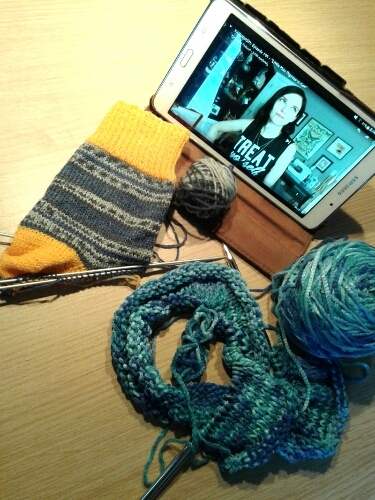 And I’m not even a fan of sock knitting (only due to lack of patience on my part ;D) Yay for vacations! Also, I noticed you mentioned steam blocking acrylic yarn in the comments. I have tried it before and it seems to be the best way to block acrylic for me. Just be sure to go slow (rather than blast full steam at it) because it relaxes quite much with steam blocking. If your swatch was not steam blocked, it is very likely the project can easily stretch out too much with full steam. Thank you so so much my dear for the tips on blocking acrylic! I’m famous for not blocking my knits. Usually I wash them, lay them flat to dry and I’m good with the result. I think steam blocking my skirt will be the most scary thing I have ever done!